The Hotchkiss M1909 machine gun was a French designed light machine gun of the early 20th century, developed and built by Hotchkiss et Cie. It was also known as the Hotchkiss Mark I and M1909 Benet-Mercie. A variant to use the .303 round was produced in Britain as the "Hotchkiss Mark I" and manufactured by Enfield. The British army employed three different types of machine gun: the Vickers medium machine gun, the Hotchkiss for cavalry use and the Lewis Gun with the infantry. It was adopted by the US in 1909 as the "Benet-Mercie Machine Rifle, Caliber .30 U. S. Model of 1909" firing the .30-06 cartridge. The name comes from three sources: Hotchkiss, the name of the American Benjamin B. Hotchkiss who started the company in France; the two main designers, Lawrence Benet and Henri Mercie; and the US designation system at time which label arms with "Model of Year". Lawrence Benet was related to the former head of US Army Ordnance at the time of adoption. 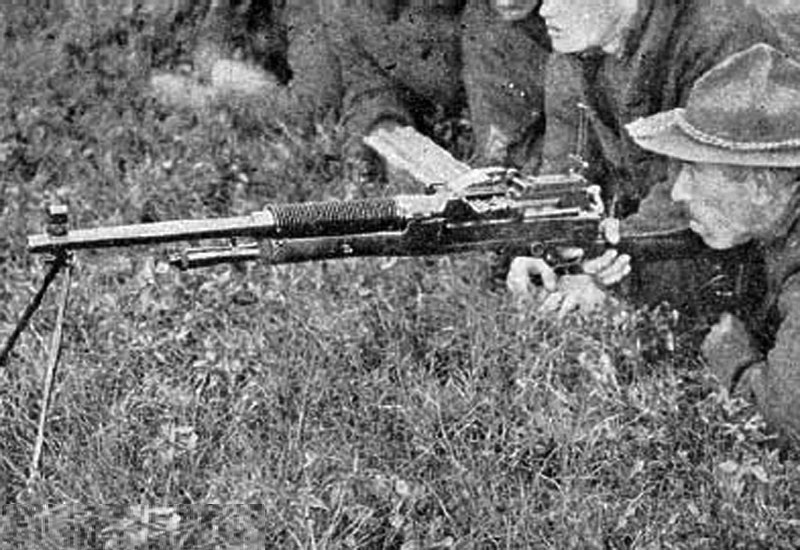 It is also known as the Hotchkiss M1909 and M1909 Benet-Mercie, but should not be confused with the heavier Hotchkiss M1914 machine gun. It was also used by other countries, including Belgium, Spain, Brazil and Australia. It was gas-operated and air-cooled, had a maximum range of 3,800 m (4,200 yd) and weighed 12 kg (27 lb). Initial models were fed by a 30-round strip-magazine but later models could be either strip- or belt-fed. The US types had a bipod, while some others used a small tripod. This tripod, fitted under the firearm, could be moved with the weapon, and was very different from larger tripods of the period. The U.S. M1909 machine guns were made by Springfield Armory and by Colt's Manufacturing Company. Total production for the United States was 670. This may seem small compared to the huge production runs of firearms later in the 20th century, but this was a significant number for the size of the contemporary US Army. 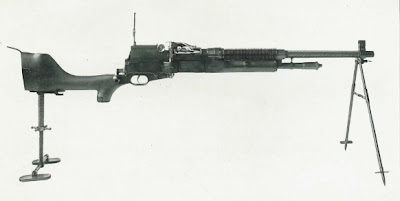 The M1909's adoption coincided with the withdrawal of the .30-06 manually operated Gatling guns from the US Army's arsenals. France and Britain used the Hotchkiss M1909 through World War I and on into World War II. The Australian Light Horse, the New Zealand Mounted Rifles Brigade and the Camel Corp used the Hotchkiss in the Desert Campaign in Sinai and Palestine (1915–17). US forces used the Benet-Mercie in the Pancho Villa Expedition in Mexico of 1916–17 and initially in France. Firing pins and extractors broke frequently on the American guns. United States troops called the M1909 the "daylight gun" because of the difficulty replacing broken parts at night, and the unfortunate jams created when the loading strips were accidentally inserted upside down in darkness.